So you’ve just opened Inkscape for the first time and you have no clue on how to do anything. You’ve come to the right place. We’ll be going over simple basics such as how to draw a line, how to change the color of objects, how to resize the Inkscape canvas, how to add a shadow, and even how to select an area. 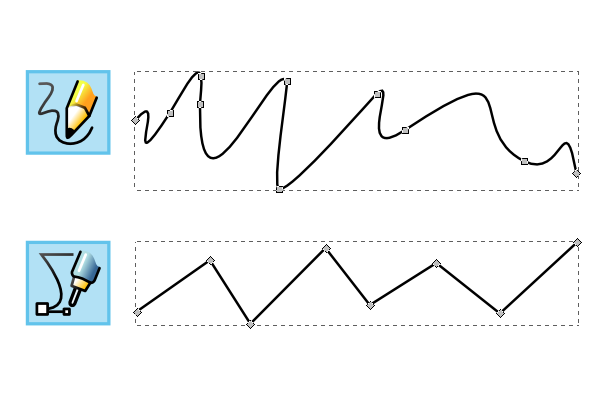 There are 2 main tools when it comes to drawing lines in Inkscape. You have the Pencil tool for freehand drawing, then the Pen tool for drawing straight lines and bezier curves. Heading up to Object > Fill and Stroke will bring up one of the most important menus in Inkscape. Fill and Stroke has everything you need for changing colors. You’ll see a variety of ways to find colors for your fills, stroke, as well as stroke styles. If you need to change the canvas size in Inkscape, head up to File > Document Properties. You’ll find many options for resizing the canvas, including standard presets. Also, you’ll find that Inkscape has a ton of flexibility with different units of measure. The easiest way to add a shadow in Inkscape is to go to Filters > Shadows and Glows > Drop Shadow. Here, you can select an object and adjust your shadow settings to your liking. Also, make sure to check Live preview to make the process easier. When you’re all set, go ahead and click Apply to see your cool new shadows! Inkscape also has 2 different tools for selecting your objects. Below we have the Selection tool, where you have to click and drag an area that fully surrounds the objects in order for them to be selected (the purple star will not be selected in this case). The second tool is the Nodes tool, where you can select objects in the same manner, but also select individual nodes. This is better if you’re looking to alter the way objects look because of the ability to move or delete individual paths. Since these are the most common Inkscape questions from beginners, I figured this would be an extremely quick and helpful guide for novice users. I hope you learned enough to get started in this fantastic software. Thanks for reading!